For a long time, i didn't really like the main person of the book, Amir. I just couldn't understand why he was so rude and finally so cowardly towards his freind Hassan. I had the same feeling for his father Baba, here I couldn't understand why he was so strict with his son. The rather short middle part, which plays in the US, was more to my liking. Both Amir and Baba were more likable, maybe because they had to be more modest. The last part, where Amir turns back to Afghanistan to look for Hassan's son touched ,e a lot. Maybe because it was an Afghanistan that I somehow know; because of one of my history projects at school. The description of the taliban, the burkas, the suppression of the people brought back many old pictures from my mind. I'm looking forward to discuss this book for our next bookgroup meeting in July. The Kite Runner will go to nice-cup-of-tea so that she can read it for our July bookgroup meeting. Where do I start? 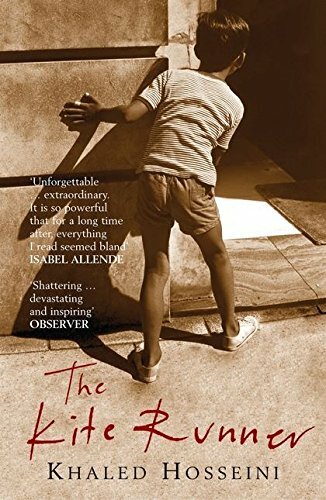 I thought this book was fantastic - beautifully written, moving, a gripping story and full of insights into life and families. Crying tally? Three times today as I got nearer to the end. The book was full of very clear images, starting with the central image of Amir peering round the alleyway, which of course appears on the cover of some editions of the book. I was thinking about what KatColorado wrote, about not liking the character Amir in the first part of the book. Whilst he was cowardly and didn't acknowledge Hassan as his friend, I thought that his honesty in his feelings about this saved him. I thought that the father - son relationship theme was brilliantly explored, in fact this theme accounts for all the main characters. Will think some more about this before the next Reading group, but I think I need to buy my own copy, as this is definitely a book to be read and re-read. The book has been back with me for a week now and I read it again to be well prepared for the Bookgroup Meeting. I liked the same parts as before - I was again very touched about the days in Afghanistan. It terrorizes me, this description of the Taliban. They seem so unhuman, they pretended to act in the name of god and were so evil in the destruction of everything they didn't approve of. I'm really scared of this kind of "faith". Now I'm really looking forward to Thursday! It does not seem to be an easy book. I hope I can read it soon. I really loved this book! The main characters are described very thoroughly and are convincing. KatColorado wrote, that she did not like Amir most of the time. That is what I liked about the book. Just because the characters are not perfect and do a lot of things wrong, they are so real. Even his father, who was always described as perfect (performing numerous acts of charity for example) has done things wrongly. I especially liked the scene when Amir's future wife confesses her "wrongdoings", and he cannot bring himself to to the same. His guilt still haunts him and influences his life. Another very important aspect in this book is the life in Afghanistan and how it changes through war and the taliban regime. The description of Afghanistan under the taliban is very shocking. Additionally, the differences between life in Afghanistan and the US were very interesting. I also liked a lot that the book does not have a happy ending. I was fearing that a bit, because in my opinion it would have spoiled the book. I forwarded the book to a collegue at work. He really liked the book, but he did not make a journal entry, nor did he release it. So the book is back with me. I gave to book to my sister. She is not a bookcrosser, but she loves reading and will pass it on.